I was soooo upset to open this and see that the powder had broken. It's such a nice colour and by far my favourite blusher I've ever used. This one is said to be a dupe of NARS - Orgasmic. I would recommend to try this one before buying an expensive one as it's really good for the price. Bargain at just £4.49 they do them in 10 shades if this one's not really your cup of tea, check out the rest of them. Possibly my favourite Real Techniques Brush! I can't believe how much of a difference it makes. This is my favourite item of the haul as well, so so glad that I purchased this one Its used for application and blending of cream or liquid foundation. I'm finally adding to my brush collection.. Yippee! Which one shall I get next? I already have the Travel Kit. Again I'm late getting this little gem, seen so many posts about them and how good they are. I was quite surprised by how much they don't budge and don't gather in the crease of the eye. Just £4.99 there's an offer on Superdrug at the minute with 3 for 2 on certain Maybelline products. They also have these in other colours too and are really pigmented. They just glide on and are easy to blend too. Have you tried any of these before? I've never really been a big lover of concealer as I don't think they work all that well, but this one is amazing! It last's all day too. I will definitely re-purchasing when it runs out. Really, really like this pressed powder it's good to control natural shine and last's a good few hours before having to touch it up. I've been using all of these products ever since receiving them on Saturday. How pretty is this colour? Well I think this one was a cheap but successful haul, I can't stop using everything. This is the ideal haul, I love all of these products! Can't believe how good they both are especially for the price you pay too! The colour tattoos are so ideal for me in a mad rush morning they don't take 2 secs to apply. how good is the sleek blusher? Definitely going to be a re-purchase!! Love the look of the Eye Tattoo, so perfect! Thank you chick, I'll go and check out your blog now. Ahh I love all these products! The maybelline tattoo shadows are amazing aren't they Hun, I wish they made a neutral non shimmery one it would be great for a base. 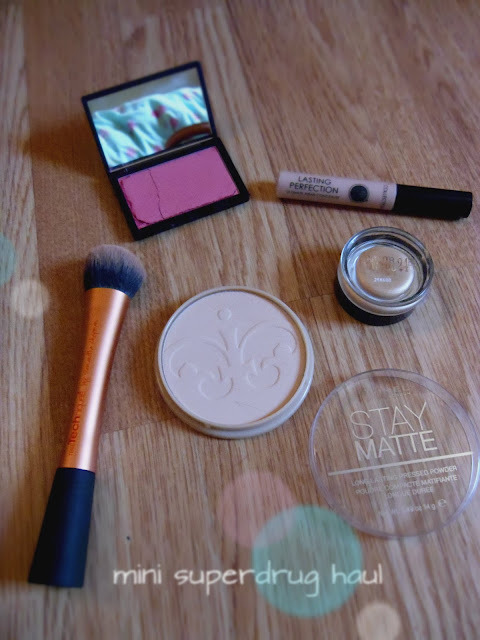 Such a shame about the blush though :( do you think you could take it back & swap? Yeah I totally agree :) I wish they would bring out a MUA matte palette too. I doubt it now but nay mind it was only £4 something, although I was gutted about it last week haha. aaw no :( it's a shame about the blush breaking, but I agree it's a gorgeous colour! 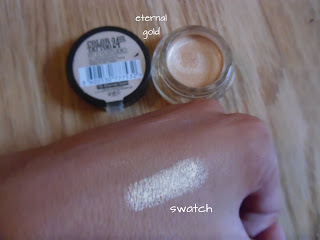 I finally bought one of the Maybelline Colour Tattoo pots too and I love it, it's so perfect as a base or just for everyday wear :) I think eternal gold is next on my list! Yeah I thought the same :) So easy and quick to apply in a morning when I'm half asleep haha. that blush looks beautiful! minus the fact that it is cracked of course. It is such a nice colour on the cheeks when applied too chick, Rosy with a hint of hold shimmer. Great haul! The blush looks really lovely, though I'm sorry that it was cracked! New follower! Me too.. It's like one of those moments when you drop your make-up bag/box and you daren't pick it up haha! Definitely recommend this one chick. In fact the new post I've just put up includes it and has a bronzer and highlighter to go with :) £10.00 too... bargain'el! I will probably put a post up when I buy my next blusher brush anyway chick :) Definitely recommend to check the blush out though it's gorgeous!